UJV 257, also referred to as Villa Hurikan, in Colombier, St Barts, was named after the ancient God of the wind of the Caraibe Indians. 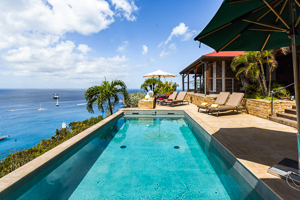 This villa has incomparable ocean views and breathtaking sunsets. Provencale, Greek and nautical influences mingle in harmony. 18th century patina methods are used decoratively on the woodwork and the walls. Three superb bedrooms, each with a spectacular view, are equipped with televisions. The bathrooms have exquisite tile work. The pool enjoys sun all day long. The villa is totally private and quiet, away from neighbors and on private land away from public roads. It boasts one of the best locations on the island. PLEASE NOTE: This villa rents for list price over Thanksgiving; there are no breakdown rates.